Shinichi Kudo (工藤 新一 Kudō Shin'ichi?) is the protagonist of the manga and anime. Viz romanized his original name as Shin'ichi Kudo while Shogakukan's website romanizes it as Shinichi Kudoh. He is the childhood friend and the romantic interest of Ran. 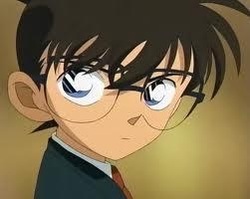 At the beginning of the Detective Conan series, Shinichi is a 16-year old (17, according to the anime) student at Teitan High School who has become famous for helping the Tokyo police solve murder mysteries. Shinichi was born to Yusaku Kudo, a mystery writer, and Yukiko Kudo, a former movie star. One day, Shinichi brings his friend Ran to a local theme park called Tropical Land, to celebrate her victory in the Metropolitan Karate Championships. He later ends up solving a murder case there. [ As they are leaving, Shinichi heads off alone to follow a suspicious man in black, Vodka, who was a suspect in the earlier murder. Shinichi witnesses a blackmail exchange between Vodka and a company president in a secluded area just outside the park, but is too engrossed to notice Gin, Vodka's partner, sneak up from behind. Gin knocks him out and forces him to swallow a new experimental poison known as APTX 4869, and they then leave him to die. However, instead of killing Shinichi, a rare side-effect occurs: his body shrinks into that of his six year-old self. After escaping from well-meaning but skeptical park security, with nowhere else to go Shinichi heads home. He there runs into his next door neighbor and close family friend, Professor Agasa, who warns him that he must keep his identity secret because the Black Organization will kill him and others associated with him should they discover the truth. Conan Edogawa (江戸川 コナン Edogawa Konan?) is the alias used by Shinichi Kudo in his shrunken form. Shinichi took the appearance of his six year old self after being exposed to a prototype poison called APTX 4869, which he had been forced to swallow by two men in black later revealed to be members of the Black Organization. The poison deaged Shinichi's entire body except for his nervous system and therefore he still has the personality, memories, and incredible deductive ability of his teenage self. Conan's goal is to hunt down the Black Organization and have them arrested for their crimes, as well as find an antidote to the APTX 4869. To do so he plans to make the washout detective Kogoro Mouri famous in hopes of attracting cases related to the Black Organization. 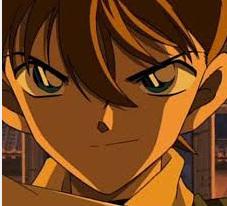 Conan is often treated as a separate character from Shinichi by fans, and often viewed as the main character of the series while Shinichi is viewed as a recurring character. He has become a popular figure in Japan and even appeared at numerous occasions in different anime series (i.e. mainly cameo appearances) as well as other medias. Ran Mouri (毛利 蘭 Mōri Ran? ), also known as Rachel Moore in the Funimation dub, is the 2nd protagonist in the manga and anime series, Detective Conan. She is the childhood friend and the romantic interest of Shinichi Kudo. Ran is a childhood friend of Shinichi Kudo. She is the daughter of Kogoro Mouri, a private detective, and Eri Kisaki, a lawyer. Her parents separated when she was seven, and one of her biggest goals is to get them back together. 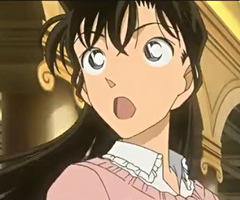 Her best friend besides Shinichi is her classmate Sonoko, who often teases her about her relationship with Shinichi. Kogoro Mouri (毛利 小五郎 Mōri Kogorō?) is one of the main characters of the manga and anime. He is a private detective and the father of Ran Mouri. Kogoro is a private investigator, but he prefers to laze around his office all day unless his client is a beautiful woman. Kogoro attended Teitan High School, the same high school as Ran Mouri and Shinichi Kudo, along with Eri Kisaki, Yukiko Fujimine, and the actress Ruri Ujo. He then graduated from Beika University, where he was the ace of the Judo team, though he was highly vulnerable to stage fright.